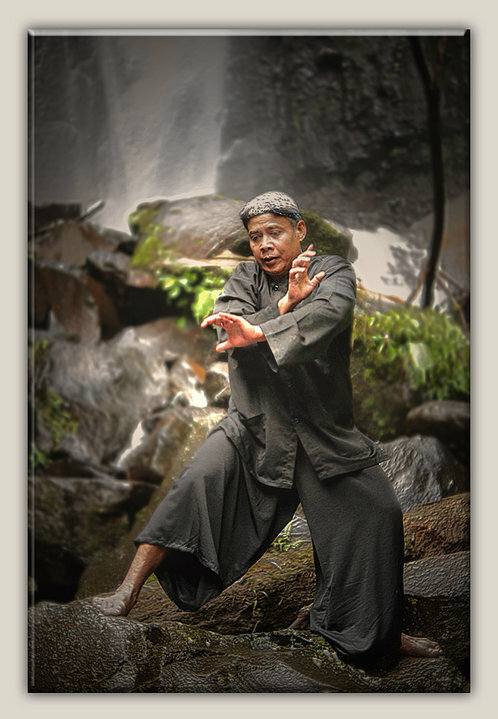 One of guru you can meet in Wisata Pencak Nusantara and the silat Genre you can explore is Kang Awang from Gerak Gulung Budidaya. A genre of silat that started from a traditional silat genre which dates back to the ancient Kingdom of Padjajaran,called Gulung Maung which is inherited from generation to generation in it’s lineage which is strictly secretive to anyone other than members of the family. At one point this silat genre got inherited to Eyang Sarean which has a son, Eyang Guru H. Abdullah who lives in Sukaraja Bogor. In the time of Eyang Guru the name Gulung Maung was changed into Gerak Gulung Budi Daya ti Padjajaran, whereas this change is based upon the evolution of the violent and ferocious nature of Gulung Maung which is based by the principle “kembangna cilaka buahna pati” to a style that is much more humane and not as violent as Gulung Maung which in nature is to become like a tiger that must kill it’s prey or opponent. In that time, Eyang Guru doing pray called Istikhoroh and received a vision of a newborn baby, crawling,taking a step, and walking. Based on that vision Eyang Guru made a jurus (move) with tangtungan/adegan (standing posture of Sholat) as it’s basis. This is how the jurus (move) named Salancar which became the main focus of Gerak Gulung was created. Eyang Guru hoped that by evolving Gerak Maung intu Gerak Gulung, a person that knows this style will no longer be as ferocious as a tiger because in principal a human being is superior than a tiger and as a reminder that this style is for self defense purposes. Underneath the simplicity of Silat Gerak Gulung lies ferociousness. As their motto says, “kembang na cilaka,buah na pati” which means “it’s flowers brings harm, it’s fruits brings death”. Implied in that motto one could imagine what lies beneath the softness and slow movements that this silat style uses. One thing to remember, Gerak Gulung is a style which requires physical training, not rituals or reading literature. Absolutely not. A common misunderstanding because of this style’s relaxed but assertive movements and plays on facial expression. In Gerak Gulung the term Rakawira is used to address a person that has gained the permission to instruct. Also in Gerak Gulung the term Master and Student is not used. Instead the term brother or sister similar to a family is used. Therefore to be rightfully practicing Gerak gulung it’s customary to go through an procession called Taleq (Initiation) to be an official member of the Gerak Gulung Budi Daya family. In this Taleq ritual a person gets to know other members and listen to advices to always remember to always protect oneself and one’s heart. At the moment Gerak Gulung Budi Daya is Kang Awang which teaches in several places including his house located in Ciomas, Bogor and Padepokan Silat TMII (Silat Genre of TMII).